You need a quick formability comparison for five different metal alloys. The five tensile tests have just been completed and the engineering stress-strain curves are available, but not the numerical data. You must make a judgement about the n-value, m-value, forming-limit curve (FLC) and total elongation using the shape of the curve. Fig. 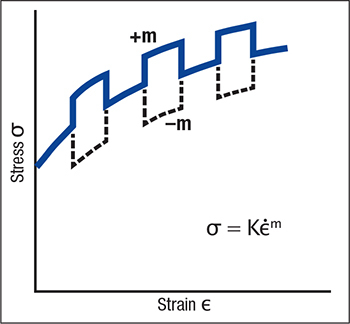 1—Six areas of the stress-strain curve can provide information about material formability. Fig. 1 identifies the typical six zones of importance. Point A defines the material’s initial yield strength. Section B of the stress-strain curve, a function of the n-value, derives from the equation σ σ = K??n. For a discussion on n-value, see The Science of Forming column in the May 2015 issue of MetalForming. Fig. 2—Measure m-value by increasing and then decreasing the speed of a tensile test by a factor of 100. The direction of the stress change provides the magnitude and direction (positive, zero, negative) of the stress change. The n and m parameters have different constraints—n-value always is positive. The deformation created by the n-value can be reversed only by annealing the sheetmetal. The m-value can be positive, zero or negative. A change in stress due to a change in strain rate will be cancelled when the deformation speed returns to its initial value (Fig. 2). A positive m-value causes the stress to increase at that location and resist deformation. A high m-value reacts similarly to a high n-value in preventing the formation of gradients (high values of narrow localized strain). Zero m- and n-values do not affect deformation. A negative m-value can have a disastrous effect on local deformation. As soon as the negative m-value starts to reduce the stress at a given location, the rate of local deformation increases and a gradient develops. The deformation rate in the gradient increases and the m-value becomes more negative. A chain reaction occurs that rapidly initiates a tear in the stamping, especially from the cut edges. There is no D portion of the stress-strain curve—the diffuse neck tears almost immediately with the total elongation restricted to the uniform elongation. Ferrous alloys are treated differently. Steel m-values always are positive and research shows them to be proportional to n-value. Therefore only n-value data are commonly measured and recorded to evaluate stretchability. To complete the Fig. 1 identifications, Point E represents the onset of the local (through-thickness) neck that identifies the start of the FLC. Point F is fracture and the measurement point for total elongation. Fig. 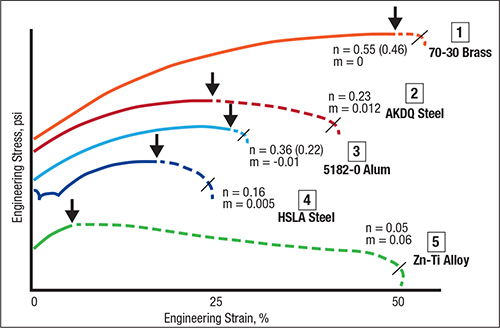 3 presents five stress-strain curves, each one for a different material. The curves are shown vertically according to uniform elongation, rather than the traditional yield-strength sequence to make them easier to understand. Based on previous information, evaluate the shape of each curve and try to estimate high or low values of n and m.
Fig. 3—The relationship between n-value (the solid line) and m-value (the dashed) during a simple tensile test can reveal much about material formability. Graphs from A.H. Ghosh, Transaction ASME 1977. Curve 1 (70-30 brass): The n-value region, extremely long, indicates a high n-value. The very-short m-value region indicates a zero or negative value. Measured values: n-value = 0.55 initial, 0.46 average for the entire curve. This alloy has n-values in the same range as highly stretchable austenitic stainless steel. The m-value is zero. Curve 2 (aluminum-killed draw-quality (AKDQ) steel: The n-value (0.23) and m-value (0.012) are positive and high. Curve 3 (5182-O aluminum): This material has an n-value of 0.36 (0.22), approximately the same as for AKDQ steel, and a zero or negative m-value (-0.01 here). 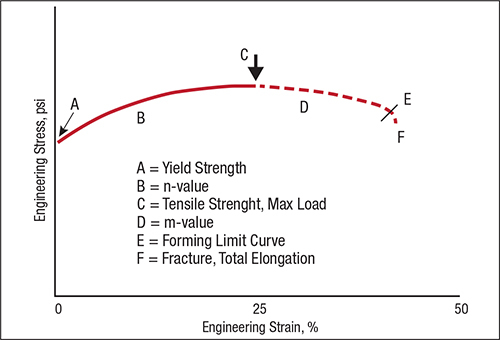 Curve 4 (high-strength low-alloy steel: These steels are expected to have lower n- and m-values because they decline as the steel’s yield strength increases. Here, n-value is 0.16, m-value is 0.005. Curve 5 (Zn-Ti alloy): The curve shape indicates a low n-value (0.05) and a very high positive m-value (0.06).